According to the American Beverage Association the above title is a true statement. I think most would agree that soda is a major contributor to obesity and diabetes in this country. See more in the video below. The first is probably the most common scenario that most of you are thinking about. A person begins a diet and exercise program and begins to lose weight. As they progress the weight loss slows and eventually stops even though they aren’t at their goal weight. I see it routinely in my practice. The second scenario is still common but people often do not think of it as a weight loss plateau. In this situation a person begins a diet and exercise program but does not lose any weight at all. While this may not be your traditional plateau of weight loss, it is still a plateau of sorts. There are many reasons a person my actually stop losing weight, but if you follow the steps below it will help you avoid this pesky problem and keep you on your path to a leaner, healthier body. Yes, eat more. Many times people begin to experience a plateau because they’ve gone months without actually eating enough. At first, this caloric deficit causes the body to burn extra energy (fat) resulting in weight loss. Over time, however, the body’s metabolism slows down to meet the amount of energy one is consuming. We must remember that the human body is designed as a survival machine. If it believes it is not getting enough food, it will slow down the metabolism to meet the energy supply coming in. When this happens, weight loss stops. For the person that begins a diet program but simply cannot lose a single pound, eating more might be essential. If someone is having trouble losing any weight, it may be because they have been under eating for many years and their metabolism has slowed to a crawl. Trying to lose weight by cutting calories will only compound the problem. Focus on eating healthy proteins, fruits and vegetables and DO NOT SKIP MEALS. Eat every three hours and your calories will go up and weight loss will resume/begin. Our bodies get used to things. Thank goodness they do or even simple tasks like walking might prove very difficult! But this also means that our bodies get used to our exercise routines and become very efficient at them. The benefit you received initially from your workout program is no longer as high. It’s the classic story of diminishing returns. As you continue to do the same exercise routine, your body finds a way to use less and less energy to do it. This means you get less and less benefit. An ideal exercise program includes resistance training (i.e. weights) and cardiovascular work. There are ways to incorporate both very easily, but it must be changed on a monthly basis. The change is essential for continuing to make progress. Didn’t I just tell you to change? Yes, I did. But you must also be consistent with several things. Your diet must be consistent. You must consistently change your workout program and you must remember that weight loss is most permanent when it is done over a long period of time. If you’re overweight, you did not get there in 6 weeks. Similarly, you’re likely not going to reach your goals in 6 weeks. Consistency in the early stages of a diet are perhaps even more vital. There is little room for error early in a diet plan. This does not mean you have to be perfect. No one is perfect. You should try and be as consistent as possible, however. In the first phase of a new lifestyle your metabolism is resistant to change. It likes the old way of doing things. It may take weeks (or months!) for it to adapt to the new demands you are placing on it. Frequent indiscretions in diet or lack of exercise will prolong the process of shifting your metabolism. And guess what you’re going to do as soon as your metabolism adapts? Change your exercise program!! The process is actually very simple, but because there’s a lot of misinformation out there regarding diet and exercise many people tend to get confused, frustrated and eventually give up. If you can remember the above steps and keep them in your head at all times, weight loss should be a relatively easy process. Finally a large-scale study has concluded what I have been telling patients for years! What you eat is more important than how much of it you eat. A calorie is not a calorie! The above statements have never made sense to me. I remember taking ‘advanced biology’ in high school. (There was nothing really ‘advanced’ about it. It was just the second of two courses, the first being ‘basic’ biology.) In this class I remember learning about physiology and how the body responded differently to different types of food. Some foods caused the release of insulin while others caused little or no release of this hormone. The job of this hormone? It basically tells the body to store fat. From that information I concluded that what you ate had to make a difference in your weight. As I progressed through my eduction in college (as a biology major) and then on to chiropractic school where I truly received advanced training, my view did not change – the quality of food that I ate had to make a difference on maintaining my weight. 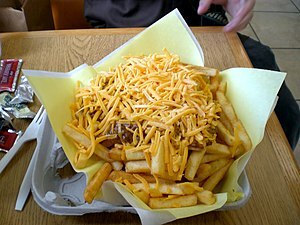 It could not possibly be as simple as calorie-in/calorie-out. A new study of just over 120,000 people finally has come up with a conclusion that makes more sense. Hopefully the American Dietetic Association will take notice. Individually there are some very good dietitians out there, but the American Dietetic Association is making people sicker and sicker with their stance on many aspects of health in my opinion. The researchers analyzed data on three separate studies over a 20-year period, tracking the long-term effects of different foods and lifestyle changes on more than 120,000 men and women. Adults in the study gained an average of 3.35 pounds every four years, for a total average weight gain of almost 17 pounds. Regular consumption of potato chips, French fries and sugared beverages were most to blame for slow and steady weight gain. However, people who ate yogurt, fruits, vegetables, nuts and whole grains either lost weight or gained the least. Now, I will be the first person to tell you that weight is not the be-all, end-all of health markers. It’s a good one, but there are plenty of thin people in this world who are very unhealthy. Also, I generally do not recommend grains be a big part of anyone’s diet. In small amounts they are ok, but they contribute to inflammation which can be problematic for many reasons. The other foods in this study – yogurt, fruits, vegetables and nuts – are free foods! Eat them as much as you want. I routinely encourage people to eat these foods as much as possible. Interestingly, nuts are a high calorie food yet they performed very well in helping people lose or maintain their weight. If it truly was about calorie-in/calorie-out then nuts should have performed poorly. It just goes to show you it isn’t about the calories that we’re putting in, it’s about the quality of those calories. As much as I’d like to say it’s only about the quality of our food that matters, I cannot. The amount matters to a certain extent. If you are regularly consuming 7,000 calories per day you will gain weight. That type of excess cannot be combated with ‘good’ foods. However, to get that kind of extra calorie one would have to consume huge amounts of the ‘bad’ foods like fast food, doughnuts, etc. Those clearly are not quality foods in the first place. I could not agree more and this has been my point to other ‘experts’ on nutrition when we debate the calorie-in/calorie-out theory. Two people are going to embark on an experiment. They are going to eat identical calorie diets for the next year. One person is going to eat 2,000 calories per day in potato chips and the other is going to eat 2,000 calories per day in chicken and vegetables. Who will be healthier and have the most optimal weight at the end of our experiment? Intuitively we would say the person eating the chicken and vegetables would be and I believe this is correct. There have been many short-term studies that have concluded healthy diets only need to focus on calorie content. The quality of the food was not important for maintaining weight. Finally a study has looked long-term and concluded that the quality of your food is important. Make sure your choices are good choices. If you focus on the quality of your food you will maintain your weight more effectively than counting those calories. Agave Syrup – the carefree alternative sweetener? Agave nectar syrup has gotten a lot of press lately. I must admit that I dismissed most of it and until today had not really looked into whether or not this natural sweetener was good or bad for us. This afternoon I had a patient call me and ask me if it was ok. I told her that I wasn’t sure, but to be safe, she should stay away from it. I am glad that I did. Here is what I found out about agave nectar syrup. Agave is marketed as a health food for several reasons. Extracts from the agave plant have been shown to have anti-inflammatory and antioxidant properties. These extracts, however, are NOT in the syrup you can buy in the stores so there’s no value there. Secondly, agave syrup is low glycemic so it has been marketed as a safe sugar for diabetics to use. This, as it turns out, is only a half truth. We’ll talk about that in a moment. Thirdly, because it comes from a plant it has been marketed to the vegan crowd as a better alternative to table sugar (because it’s “healthier”) and honey (because vegans don’t eat anything that has been taken from any animal, in this case, bees). Agave has some slick marketers. 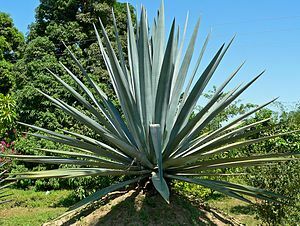 The truth about agave, however, is not so great and from now on I will advise my patients not to use it. Here’s why. Agave is low glycemic because it is made almost entirely of fructose, or fruit sugar. Fructose is, by nature, a low glycemic sugar. Fructose, however, is just about the worst sugar to use as a sweetener. All sugars are a mix of fructose and glucose. Table sugar is a 50/50 blend. High fructose corn syrup is a 55/45 blend. Agave is usually about 90/10. But what about fruit? Yes, it is true that fruit is naturally sweet because of fructose. It has very low levels of fructose. An apple for example is only 7% fructose. Plus your apple comes with vitamins, antioxidants and fiber. Agave syrup does not. Fructose, when consumed in high amounts raises triglycerides (which increases cardiovascular risks) and increases the risk of diabetes. And rats fed a high diet of fructose have been shown to build abdominal fat which is the worst kind. When agave is processed it takes any health benefit that it might have and throws it away. In the end, agave syrup is no better for us than high fructose corn syrup and may in fact be worse. Bottom line – stay away from it. The Body Mass Index, or BMI, is used to ascertain whether someone is overweight, obese or at the correct weight for their height. It’s used by health professionals across this country as a guide for their patient’s health. It’s wrong. 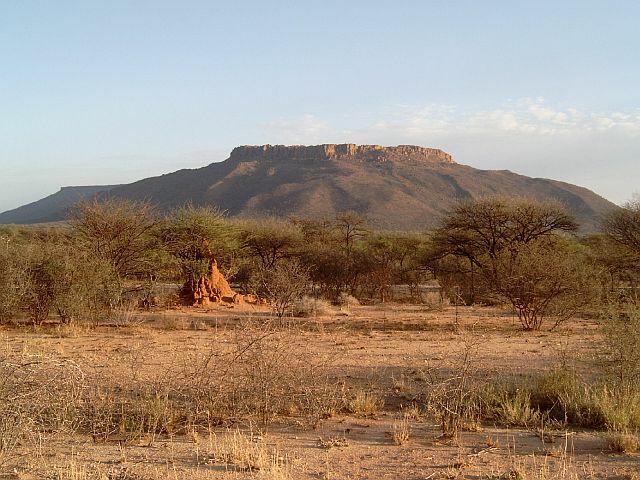 The reason for this blog is a conversation I had with a good friend of mine. He also happens to own a gym and is a very talented and knowledgeable trainer/fitness coach. We were discussing it in relation to his clients and my patients and how people are often times misled by the numbers they see when they use the BMI scale. BMI was designed to be used as an easy tool for clinicians to assess their patients in terms of body weight relative to height. Before the BMI scale was invented it was hard to assess someone’s weight and say that it was appropriate because height is also an important factor in weight. BMI combined those two. The formula is simple. You need your weight in pounds and your height in inches. Take your weight and multiply it by 703. Take your height and multiply it by itself (height squared). Now divide the first number by the second number and you have your BMI. Here is an example. We’ll use my numbers. I am 201 pounds and 71 inches tall. So my BMI is just over 28. This puts me in the overweight category, actually moving close to obesity. Wait…what? 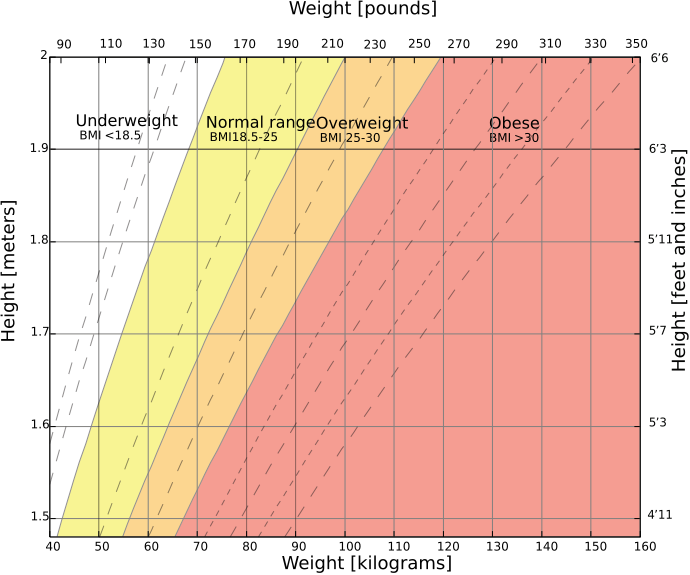 If you look below you can see the classification system used for BMI. You will see that anything above 30 is considered obese. Technically anything above 29.9 is obese. If we use this scale, I am only 13-14 pounds short of being considered obese. People who know me will tell you that I do not look obese. They will also tell you that I do not even look overweight. So what’s the catch? That is the problem with using BMI to assess health. It doesn’t take into account many factors. The problem for some people, like athletes, it does not take into account muscle mass. A person that is heavily muscled will always be overweight according to the BMI. As a matter of fact, I have been considered “overweight” since college despite always being is relatively good shape. If we look at professional level athletes, most of them would be considered obese! I understand that not everyone is an elite athlete. What about the elderly? BMI is not ideal for them either. Many times an elderly person will fit nicely into the BMI by being considered “ideal weight” for their height. This can be significantly misleading. Why? In the elderly muscle mass begins to drop. It happens to all of us. However, with this drop in muscle mass comes a drop in weight. As weight is lost a person is likely to fall into the “ideal weight” category even though they should be concerned about muscle mass loss. This loss in muscle mass causes a loss in strength and stability increasing the risk of falls and increasing the risk of osteoporosis. Another problem with muscle loss is the change in your body composition. As muscle mass is lost one’s body fat percentage increases. 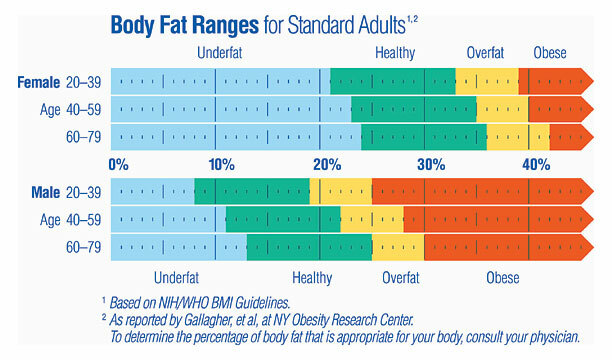 Body fat percentage is a great indicator of health. The lower it is (within reason) the healthier you are, generally speaking. So does it work for anyone? Yes, there are some people that it works for. If a person is sedentary and eats a poor diet it may accurately depict your current weight status (ideal, overweight or obese). There are, however, better ways to assess health. Then how do I know if my weight is appropriate? The best way to assess your weight status is to perform body composition. This gives us a percentage number based on body fat. For example, if you weigh 200 lbs and 50lbs of that is from fat, your body fat is 25%. Below is the ideal body fat percentages for men and women. The gold standard for measuring it is the caliper test or skin fold test. A pinch of skin is precisely measured by calipers at several standardized points on the body to determine the subcutaneous fat layer thickness. These measurements are converted to an estimated body fat percentage by an equation. It is most reliable when taken over time and it must be done by the same person to be accurate. Techniques can vary from person to person and may change the results. The other way to measure it by bioelectrical impedance. You are hooked up to electrodes that are spaced far apart on your body; usually on each hand or on a hand and a foot. An electrical signal is passed between the electrodes and the resistance to the current flow is measured. This is a painless process. Fat and muscle have different resistance rates so the machine can estimate the body fat percentage based on that. It is affected by hydration levels so be sure to be hydrated when you take a test like this. This is a very accurate method and does not depend on a person’s technique as the skin fold test does. The best way to get your body fat to the desired level is a healthy diet and exercise. You want to increase muscle mass and decrease fat. This is done by weight training and short duration, intense circuit type workouts. All of this can easily be done at any local gym.